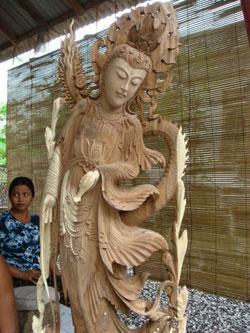 ASIAART offers to sculptors craftsmen, through fair trade, a real opportunity to develop themselves. ASIAART ’s aim is not to despoil of those craftsmen but to allow them a decent life by investing for them on raw material and by incresing their wages of this work by 2 or 3. The development of their art lies on their investments, we bring them the possibility to show their art to a diversified public and as a consequence, to maintain their standard of leaning. This activity, more than a job, requires a lot of attention from the craftdman. Besides, it is difficult to count and rationalise, fair trade which is called a minor activity. ASIAART proposes its concept of partnership by helping on sustainable development and through the respect of various charters and agreements in forest managment as well as working environment. They offer them a window to make their name worldwide and have people to get one of their art work. The particularity of this approach allows customers to ask what they want before manufacturing this will create a special contact to have the special item required by the constomer.